Visit Philadelphia's new elevated park. Now open to the public. The CCD has completed the construction of the first phase of conversion of the defunct Reading Railroad viaduct into the Rail Park. The park opened to the public on June 14, 2018. The CCD now maintains the park in partnership with the Department of Parks and Recreation – with Parks and Recreation sharing the cost of cleaning crews supervised by CCD, CCD providing routine patrols with its Community Service Representatives, and Parks and Recreation handling landscape maintenance. The Friends of the Rail Park promotes the park. CCD is working on the next phase of the Rail Park that will extend from Vine Street north across Spring Garden Street. View the latest video from Philly By Drone below showing the project's progress to completion. The viaduct was built in the 1890s to carry passenger and freight trains into Center City and consists of steel structure, elevated filled areas and arched masonry bridges that all provide spectacular views of the city, even though the last train traveled its rails in 1984 and the viaduct was abandoned to weeds and disrepair. In 1995, SEPTA acquired the quarter-mile-long, 26,000-square-foot spur that curves off northwest from the main branch and runs from Callowhill Street to Noble Street. The Center City District was drawn to the project in part because of the success of the High Line Project in New York City in fashioning new green space from derelict tracks and because it could create an opportunity to add residential and light commercial development in the expanding communities of Center City and Chinatown. 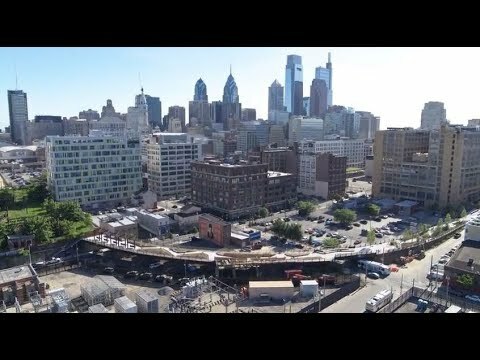 With 32% of the land in the area around the viaduct still remaining vacant and undeveloped, the opportunity exists to create a unique, mixed-use, mixed-income neighborhood like none other in Center City. With generous contributions of $50,000 from the William Penn Foundation and $25,000 from the Poor Richard’s Charitable Trust, the Center City District in 2010 commissioned an environmental and feasibility analysis of the entire viaduct. The consulting team was Urban Engineers; Cecil Baker + Partners; and Friends of the High Line, New York City. The City of Philadelphia retained Jones Lang LaSalle. The consultants jointly evaluated options that included total and partial demolition of the viaduct, as well as renovation alternatives, and assessed the potential impact of each option on real estate and community development in the area. In 2010, the Center City District began working in partnership with the community-based Friends of the Rail Park [formerly known as Reading Viaduct Project] and the City’s Commerce Department to evaluate the options for the abandoned viaduct that runs north in two segments: from Vine Street to 13th and Noble streets to the west; and to the 800 block of Fairmount Avenue to the east. The study revealed that renovating the viaduct was far less expensive than demolishing it (at a cost of $50 million) and that significant environmental liabilities and costs could be minimized by capping and covering any contaminated soil that might still exist in the fill beneath the tracks. Further, the team confirmed that new housing could easily be constructed on the triangular vacant parcels that are adjacent to the viaduct and that a transformation of the viaduct into a park would have a far more beneficial impact on development in the area than the more expensive alternative of demolishing the structure and disposing of potentially contaminated waste. In 2011, based on these conclusions, and with further generous contributions of $75,000 from the William Penn Foundation and $25,000 from Poor Richard’s Charitable Trust, the Center City District commissioned a concept and schematic design study, which was conducted by Urban Engineers and Studio Bryan Hanes. The study, which focused on the SEPTA-owned spur only, was prepared in partnership with community stakeholders and the Philadelphia Department of Commerce and Department of Parks & Recreation. It began with a neighborhood meeting in fall 2011 to discuss community preferences and aspirations for the viaduct. In January 2012, the design team presented multiple design options at a community meeting with residents, property owners, and businesses from the area. Following the meeting, an online survey was conducted in which more than 50 participants expressed their preferences and provided extensive comments. The community participants strongly favored making the park an informal, leafy green space with plenty of grass and flowering plants, and with room to walk and sit. They wanted the park to maintain the industrial authenticity of its origins, while still meeting modern safety, code and access requirements. In March 2012, Studio Bryan Hanes and Urban Engineers, incorporating the preferences cited by community participants, presented renderings of a new public park on the SEPTA spur. The design called for entrances to the viaduct on North Broad Street at Noble Street, at 13th and Noble, and on Callowhill between 11th and 12th. The response from the community was enthusiastic, resulting in the selection of a preferred schematic design alternative. In July 2016, the CCD began the competitive bid process based on construction documents prepared by Urban Engineers and Studio Bryan Hanes. In September 2016, Governor Tom Wolf announced the award of a $3.5 million Redevelopment Assistance Capital Program (RACP) grant to the CCD for the Rail Park, which enabled the project to move to the construction phase. Six qualified contractors bid on the project and the CCD selected A.P. Construction, a regional contractor with offices in Philadelphia, as the lowest responsible bidder for the project. Of the total project costs, 21% was subcontracted to Minority Business Enterprises and to Woman Business Enterprises. Through a grant from the city Department of Commerce to the Center City District, Urban Engineers and Studio Bryan Hanes completed construction documents and a cost estimate for the first phase of the project. Construction funding was provided by generous contributions from the William Penn Foundation, the Knight Foundation, The McLean Contributionship, the Commonwealth of Pennsylvania and the City of Philadelphia. planting trees, shrubs, grasses and flowering plants on the viaduct as well as the adjacent stretch along Noble Street. On June 14, 2018, the CCD completed the first phase of the Rail Park and the park opened to the public. The Rail Park’s Phase 1 is a proof-of-concept that will be used to advance the next phase of the project: the undeveloped area of the viaduct to the east of the Rail Park, extending from the main branch to 9th and Fairmount. For more information about the Friends of the Rail Park, visit therailpark.org. Thank you to the many donors whose generosity made the Rail Park a reality.